Do you think that studying grammar is important in early literacy??? I think it definitely has a place. For my own grade two class, which is highly ESL, I find that these kinds of exercises are really good for them. They are old enough, and have 2 years of English schooling, in order to understand the grammar concepts. It’s really good to sit down and analyze the grammar skills at this level, as they don’t get very much modelling of proper English grammar at home. Also, for native English speakers, grammar lessons will help them when they learn a second language in school, as most formal second language instruction starts with vocabulary and grammar lessons and if they don’t know how to explain the rules in English, how are they supposed to understand them in French or Spanish? 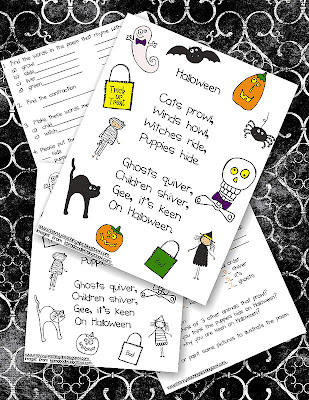 I have just put up a little Halloween package that has a grammar component. You can download it for free!! Scroll down for more information. You can download this little lesson here. This little download inlcudes a colour version of the poem to project, or print out for your lesson, a blackline master for the students, a grammar worksheet which goes over some basic grammar concepts, and of course, the answer key! Thanks for joining my linky party! I am now a follower of your great blog!